(bloomberg) -- If you’re wondering why index-tracking funds are suddenly losing more money this year than active managers in the stock market, look no further than their performance. Two months into 2019, more than half of mutual funds have beat benchmarks, a rate that if sustained would mark the industry’s best year in a decade, data compiled by Goldman Sachs showed. 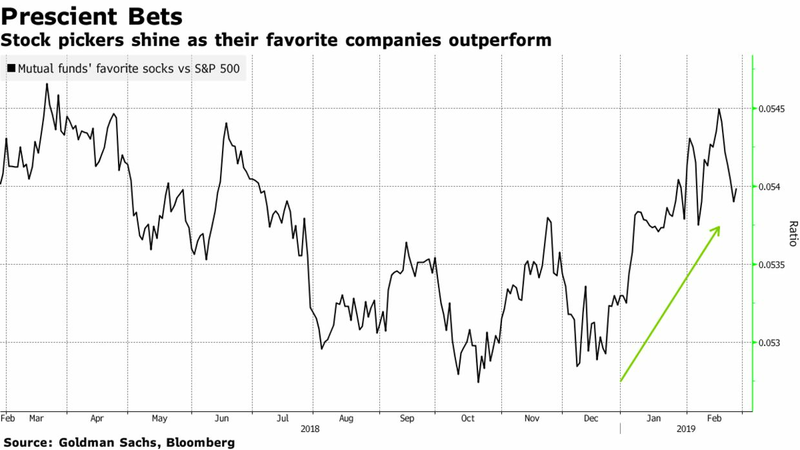 Helping their scorecards are the prescient bets on industrial and energy stocks, which have rebounded from the fourth-quarter sell-off faster than almost any other S&P 500 groups. Whether stock pickers will be able to build on the gains is anyone’s guess, but investors seem willing to give them the benefit of the doubt, at least for now. After trillions of dollars were poured into index funds and ETFs over the past decade, a pivot toward active management is starting to emerge. Since January, mutual funds that focus on U.S. equities have attracted almost $4B of new money, while ETFs lost nearly $10B, data compiled by Investment Company Institute and Bloomberg showed. It’s exceedingly rare that active managers beat passive funds in the stock market, which explains the overwhelming preference for the latter. The carnage that began in equities five months ago and subsequent rebound is shaping up as a giant exception. Goldman’s data shows the number of funds beating benchmarks rose “sharply” during October-December sell-off, consistent with prior routs. As stocks bounced back post-Christmas, active managers continued to shine. About 53% of the funds have outperformed this year, compared with a 10-year average of 34%. Bets on cyclical shares such as industrial and energy paid off. On average, their relative exposure to machinery and equipment makers rose to the highest level in five years at the end of December. The group has jumped 18% this year, almost double the S&P 500’s gain. At the same time, their aversion to defensive stocks such as utilities and consumer staples paid off as the shares have trailed the market. Not all of their wagers have played out to their advantage. Despite adding to chipmakers and Apple shares, technology remained one of the least favorite sectors. The group is the market’s second-best performer this year. On the other hand, health-care, home to some beloved stocks, has been disappointing with the worst return behind utilities.